For If you are interested in restoring the shine and protecting your boat’s exterior, it is recommended to use a quality boat hull wax each year. Without this protection, some boats will oxidize dulling its appearance. You can either apply boat wax using a buffing machine or by hand to help improve your boat’s appearance while giving it a solid layer of protection. Here are a few tips on what to search for in the best marine waxes and a few reviews to help you start shopping. With good maintenance, a boat can maintain its appearance and serve you for a long time. This makes marine waxing an important step in its maintenance process that you definitely don’t want to skip. UV radiation is another hazard to your boat’s appearance causing damage while your boat is just sitting out there on the water. When you apply a layer of the wax, you reduce the chance of damage to the boat’s exterior. Always use a boat wax that has UV protection as well as gives you a shiny and pretty appearance that will last for years to come. This will also reduce the friction between the boat and the water while giving you smooth movement in the water. If you have a fiberglass boat that has a gel coat, it is important to give it enough protection. While a gel coat will look great when it is new and have lots of shine, as it sits out in the sub it can become badly damaged from UV rays which can cause the finish to have a chalky feel and look. Over time, the sun will damage your boat and that attractive shiny look will start to erode. Remember that you can always improve your boat’s appearance to its original look by just using some fiberglass boat wax. Specifically designed for either linear polyurethane or gel coat surfaces, boat wax is chemically different from automotive paints. Both gel and polyurethane coatings are harder and more water resistant in comparison to the automotive paints. With a special chemical composition, boat wax has special ingredients that are designed for use on boats only. Not only are automotive products unable to achieve the same results on the boats, but their protection levels will be a lot less. Here are some things to look for when choosing and then waxing your marine vessel. Your first step in choosing a good boat wax is to determine the type that works the best for your boat. Once you know the type you need, it is easier to narrow down the brand formula you want. Carnauba-Based Wax: A high-quality option that utilizes the best in polymer technology. Known for giving extreme protection that lasts a long time, carnauba-based wax not only cleans your boat but gives you two layers of protection. When used regularly, this type of wax helps to maintain a clean and polished look so you no longer have to rub and buff your boat to get rid of the effects of UV rays, acid rain, or even bugs. If you do your homework, you will find easy to apply products that are non-abrasive and repel dirt. Metal Wax: Using a specialized formula, metal wax is good for metal-made boats. It is the perfect wax for copper, aluminum, brass, chrome, and stainless steel. It not only polishes and cleans your boat’s exterior, but it also can protect marine accessories. Metal wax is safe and easy to use and is available in either a paste or liquid. Fiberglass Wax: Specifically made for fiberglass boats, fiberglass wax does not need rubbing or buffing during application. It gets rid of film, stains, grease, oil, dirt, and rust while restoring the original color of your boat. It also gives you protection against UV rays, acid rain, and salt spray with a finish that can last all season. Boat wax can be used on the deck as well as underneath your boat to prevent damage from detergents, stains, and salt water and to stop excess marine growth. It is helpful if you can find a waxing solution that is an all-in-one product. If you buy a wax that gives your boat a gloss finish, it will have an abrasive that polishes away dirt and oxidation. A pure wax will require some work on your part to get rid of surface stains making it a bit more time-consuming. For more information on which boat wax to choose, follow the below link. Mild Abrasives: For those that want to save time and money, look for a wax formula that includes a cleaner. If you have even a little bit of abrasive in the cleaner, it will help to remove grease, rust, stains, and dirt off your boat. Remember that all-in-one solutions are the best. Lasting Shine: You will find that some cleaning and waxing solutions do not have a shine that will last you a long time. Wax formulas that give you a gloss the same way that a pure wax will is the best choice and is most apparent with gel coats on boats that are oxidized or filled with dirt. Mineral and Organic Stains Remover: You also want a wax formula that gets rid of mineral and organic stains. Organic stains are like bird droppings, stains from wine or spilled drinks, and food. Mineral stains include stains from exhaust ports and metal accessories. Even if you can’t find a wax formula that can rid of both stain types, look for one that can get rid of dirt and prevent damage to your gel coat. Avoid formulas that use strong solvents like methyl ethyl ketone and acetone. Protection: While removing stains from your boat’s surface, boat wax should also give it protection from grease, detergents, marine growth, UV rays, and salt spray. Easy to Apply: Many wax formulas need several steps in their application process which isn’t always the best solution for busy people. If you need something faster, look for a product that uses a thin layer of wax that can clean a larger area making the task go much faster. Versatility: Product versatility can help cut the cost of your boat if you can use it for other projects like an RV or airplane. Versatility in a product also tells you that it is a durable and impressive coating solution. Always practice a safe and careful application process to get the best results from your boat wax. Here are a few tips from professionals to help you finish the project fast and efficiently. Carefully Read the Instructions: Always read the instruction manual that is included with the boat wax to make sure you use it correctly. It will also protect your skin from irritation in case you have to wear gloves while you apply the boat wax to your boat. Prep Your Boat: Always prep your boat before you apply boat wax. You want to make sure it is in a secure position like a flat, ground level surface. You will find this helps since you will be going all over your boat applying and spraying the wax formula on every part of it. Also, make sure to cover your boat’s interior before you wax as it is helpful to clean the exterior of your boat without worrying about anything inside it. Gather Your Tools: Before you begin to apply the boat wax, make sure you have all the tools you need for the job. Tools like a little cotton fabric, a soft-bristled brush, a deck brush, and a chamois can come in handy. First, Wash Your Boat: Completely wash down your boat before you begin to restore its shine. This will help you to find the tough and stubborn stains, scratches, and dings that you need to focus on. You can also remove all types of dirt and grime just by using a hose. Just plain water is useful when cleaning the exterior. Use a wet sponge when you need to clean off grime, and it is recommended to use sandpaper which damage your boat’s glossy finish. Do Not Rub the Wax on Too Hard: You do not have to rub the surface of your boat too hard since the boat wax will have enough compounds to get rid of really stubborn stains that you have on your boat. All you need is gentle pressure in only one direction to carry out the job. Begin at the Transom: One of the most efficient ways to apply boat is to cover two feet by two feet section at one time starting at the transom and then continuing on to the bow. If you do use a buffer, make sure to start at the slowest setting. Be Careful Around Non-Removable Fittings: Always use fabric when working on non-removable boat fittings. If your boat has removable parts, make sure to detach them before polishing them. Always keep the screws with fitting so you do not lose them or get them all confused. Follow the below link for more information on using boat wax. Best Boat Wax Reviews – What is the Best Boat Wax? Below are the best boat wax and Restorative/ Cleaner Marine Waxes that best suit your marine needs. 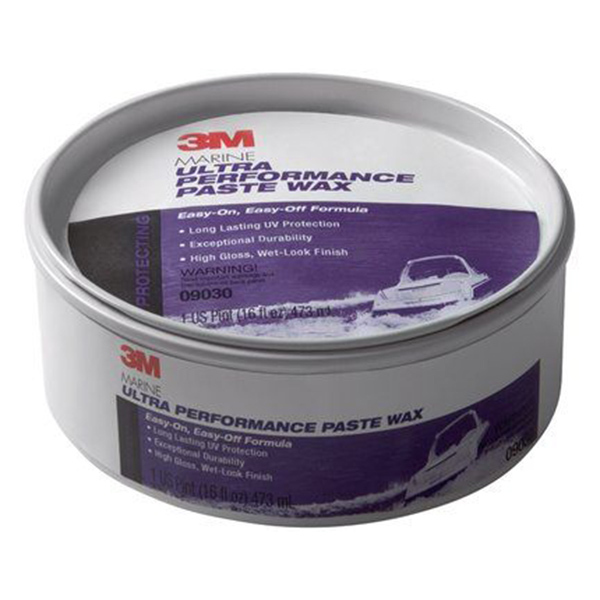 If you are looking for a high-performing surface wax for your boat, check out the 3M Ultra Performance Paste Wax with both water beading and soil release properties that are combined with the durability of acrylic. Providing a high gloss finish on painted and fiberglass surfaces, this is to apply and take off wax has a formula that is long lasting through soil, sun, and rain. Featuring a unique form of polymer technology, the 3M polymer technology gives your finish durability with a Carnauba wax base that gives additional protection. This is an innovative formula that covers well and polishes off quickly either with a buffer or by hand. The Ultra Performance works on painted surfaces, marine topside paints, and fiberglass gel coats. The end result gives you a high gloss finish that lasts a long time giving you great fade resistance and water beading action. Designed to give you boat a wet look, this is a good boat wax for protection that also gives you a great looking result with not a lot of work. 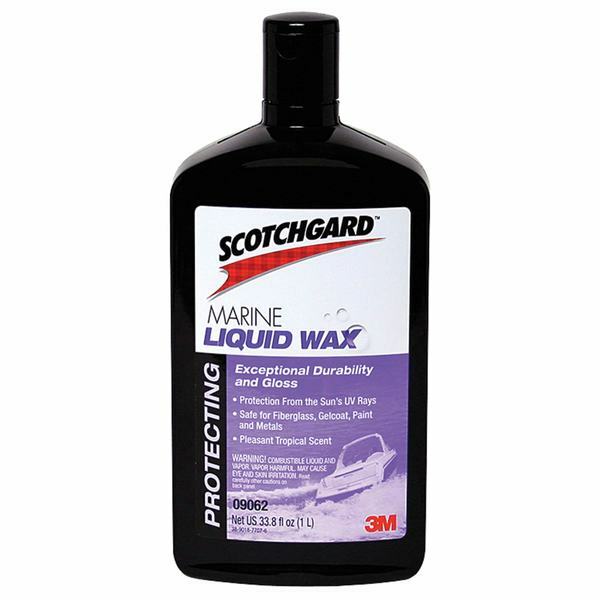 Created to withstand the trial of a marine environment, Scotchgard Marine Liquid Wax provides a durable and protective gloss on your boat that adheres to its surface for a durable finish. With a gloss that is the envy of other boat owners, Scotchgard uses reactive chemistry that bond’s with the surface of your boat to protect against weathering that can damage or fade surfaces. Easy to apply, this boat wax is safe to use on topside paint, fiberglass, and gel coat. This is a liquid wax that is easier to apply when you compare it to other paste waxes. Featuring a nice tropical scent, Scotchgard Marine Liquid Wax is a great last step in protecting the glossy, almost new appearance of your boat protecting it for years to come. Protecting against damaging UV rays, this liquid wax maintains the shiny appearance of your boat when paired with other 3M products giving you a cleaner and shinier looking boat. 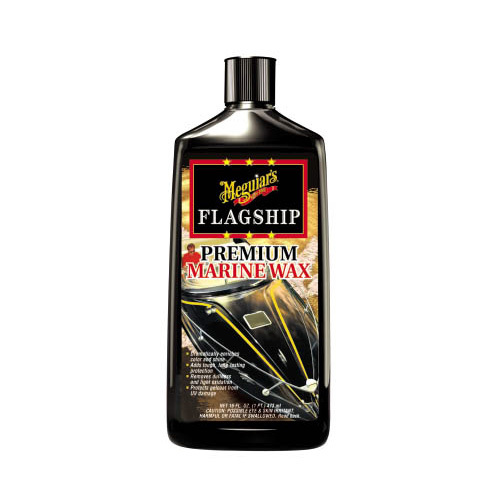 Designed to give you the most protection, Meguiar’s Flagship Premium Marine Wax is an easy to apply product that gives you a deep gloat on gel coat and fiberglass with polymer protection that is long lasting. It is a good boat wax even after spending days out in the sun, the Flagship Premium will protect your boat against harmful UV ray damage and wear. It will also remove swirls, fine scratches, and light oxidation enriching the shine and color of your boat and bringing out all of the richness of the boat’s appearance. Easy to apply with a reasonable amount of time spent on the application, the Flagship Premium helps to remove the hassle of routine boat maintenance. Apply with either a polisher or hand pads. This product is perfect for all kinds of boats and RVs and is included in the Classic Marine and RV line. A restorative cleaner for fiberglass boats, Meguiar’s Fiberglass Restoration System is a specialized system with three steps to restore all gel coat and fiberglass boats and RVs. This package includes three products that will give you durable and long-lasting protection that restores surfaces so your boat or RV will be ready for its next adventure. Easily apply each product either by hand or with a polisher for a simple application or removal process. Protecting your boat and Rv from fading, oxidation, and UV damage, this product gives you long-lasting results that will your boat back to life. This fiberglass restoration system will also remove oxidation stains as well as scratches from your boat while making it shine with a high gloss finish. Each bottle contains sixteen ounces to give you the durable results you are looking for. The Mequires Fiberglass Restoration System is the best boat wax for oxidation and repair. Designed to wax, polish, and clean, Meguiar’s One Step Cleaner Wax for boats and RVs is a marine wax designed to restore gloss, brilliance, and color to your boat while giving you lasting protection. This one-step cleaner will remove haze and light oxidation along with swirls and light scratches. Safe to use on gel coat and fiberglass surfaces, this wax is also comprised of anti-corrosive ingredients that will help stop rust from forming. With long-lasting protection from the marine environment like UV rays, corrosion, and salt air, Meguiar’s One Step Cleaner Wax is a non-abrasive formula that will safely remove defects and restore color and gloss saving you both effort and time. This one-step boat wax will give you great results when applied either by hand or by a polisher. Available in varying sizes, you can purchase the amount you need depending on your project. The clear winner of the best wax for boats roundup is the 3 M Ultra Performance Paste Wax. This high-performing surface wax for your boat features both water beading and soil release properties that combine with the durability of acrylic. Giving you a high gloss finish on painted and fiberglass surfaces, this is an easy to apply and take off wax with a formula that is long lasting through soil, sun, and rain. Featuring a unique form of polymer technology, the 3M polymer technology gives your finish durability with a Carnauba wax base that gives additional protection. This innovative formula covers well and polishes off quickly either with a buffer or by hand working on painted surfaces, marine topside paints, and fiberglass gel coats giving you great fade resistance and water beading action. Designed to give you boat a wet look, this is a good boat wax for protection that also gives you a great looking result with not a lot of work. The definite winner of the best boat wax roundup is the 3 M Ultra Performance Paste Wax hands down. Great informative article. The boats need to be polished once in a while. I am using Fiberglass Wax for polishing my boat because does not need rubbing or buffing during application.